By Eric A. Kimmel While everyone else in the house prepares for Hanukkah, Jacob wants nothing but to play with his new brass dreidel. When he is sent to fetch water, he accidentally sends his dreidel into the well. Little does Jacob know that a good-willed, if mischievous, goblin lives at the bottom of the well, and that he will then receive a few special gifts. This re-telling of the old tale "The Tablecloth, the Donkey, and the Stick" in a Hanukkah setting shows that sometimes honest boys don't need magic dreidels to spin some magic of their own! Katya Krenina's illustrations evoke the liveliness of the holiday as well as the rustic settings of Jacob and his family. She brings subtle warmth into the winter season, even stripping a fantastical goblin of any eeriness that might be associated with it. Eric Kimmel's clean, clear writing makes The Magic Dreidels a wonderful selection for bedtime stories as the days get shorter. Eric Kimmel is back again with his variation of the story "The Tablecloth, the Donkey, and the Stick". When Jacob tries to fetch a new brass dreidel that fell down a well, he meets a peaceful goblin who happens to live at the bottom of the well. The goblin offers him a dreidel to replace the one that was lost. Unlike the simple brass one, however, this one spins out latkes. Jacob is so excited about his new gift that he tells everyone in town, including Fruma Sarah who tricks Jacob out of his magic dreidel. The goblin gives Jacob a new magic dreidel, but Fruma Sarah again manages to trick him out of his dreidel. Jacob and the goblin come up with an idea to get both magic dreidels back and teach Fruma Sarah a lesson at the same time. Eric Kimmel's superp storytelling style makes this a perfect choice for reading aloud. Katya Krenina's warm illustrations enhance the text and draw readers even further into the world of goblins an magic. By Marilyn Kallet One for Each Night will appeal to a broad audience. 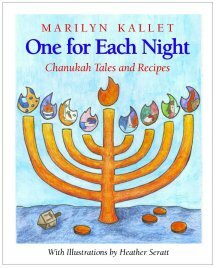 It provides a gift for each night of Chanukah, something for families to share, an inspiration for the holiday season. It is a must for parents and children who enjoy Fairy Tales. It is a catalyst for all that enjoy creative cooking. When Professor Kallet found herself unable to buy gifts for her family, she used her talents as an English major to write stories for each night. She eventually compliled each story with a related recipe to create this enjoyable Hanukkah collection. One For Each Night is well-designed to be used by the entire family. Families can read the short stories aloud and try out a new recipe each night. By Eric A. Kimmel Kimmel is a storyteller who is producing a number of excellent Jewish stories that children of all faiths enjoy. He retells eight tales in The Spotted Pony. There is one for every night of Chanukah, each of which is preceded by a brief shammes story (after the shammes candle) which is a practice Kimmel learned from his grandmother. The volume, illustrated by prize-winning artist, Fisher, is a perfect family read aloud for children seven and up. By Dian G. Smith A charming board book with simple text and rhymes based on the traditional song "On this night let us light," this book boasts shiny gold foil flames on each candle as it appears in the menorah. The shammash, the helper candle, is painted gold but does not have the foil so that the eight candles can be counted properly. The story of Hanukkah is presented on the inside cover, but for the very young, it can be a "parents only" read. One notable feature included is the instructions on how to play the dreidel game, generally omitted from holiday books. The mop-headed family could use happier faces, but they seem content in their celebration, and you will be, too. The words of a traditional holiday song ("On this night let us light one little candle fire") lead readers through an explanation of the celebration of the holiday. The book opens with "The Story of Hanukkah," followed by descriptions of various customs and activities-lighting the menorah, playing dreidel, eating latkes and doughnuts, and exchanging gifts. The words to the song run across the bottom of each page; however, the music has been omitted, making it difficult for people who don't know the tune. The double-page watercolor illustrations with heavy black outlines have a stylized, 1970s feel. Children will find the shiny foil candle flames appealing. 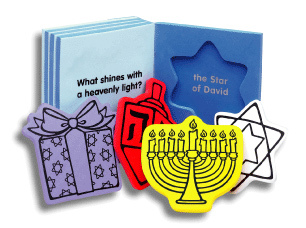 By Marty Noble Children learn about one of the most joyous Jewish holidays as they apply 27 full-color stickers of boys and girls, a menorah, dreidels, other images to a background scene depicting a pleasant living room in a Jewish home. By Norma Simon Jewish children look forward to Hanukkah more than any other holiday, and The Story of Hanukkah explains why and how people observe this beloved occasion. You�ll learn that Hanukkah is the Jewish people�s way of remembering their ancestors� revolt against a cruel king. Then you�ll understand why the holiday is eight days long, and even learn how to make latkes using the author�s own recipe! A newly illustrated, attractive edition of a 1966 title. Simon presents the history and traditions of Hanukkah in an easy-to-read manner. There is a detailed recounting of the Jews' oppression by and rebellion against the Syrians, beginning with the story of Mattathias and continuing with Judah and the Maccabees, through the rededication of the temple. The story, or legend as Simon calls it, of the oil that lasted eight days when there was only enough for a single day is presented separately. The author also describes the menorah, the dreidel, the celebrations, gifts, and food associated with Hanukkah. The book concludes with an explanation of the dreidel game and the Jewish calendar and a recipe for potato latkes. The full-page, colorful, ink-and-acrylic illustrations that face each page of text have a soft, impressionist look. In recent years, few books that take this factual approach to the holiday have been published. This book explores the holiday's ancient origins and describes today's Hanukkah customs. The dreidel and dreidel game are explained, and a recipe for latkes is included. The age group recommendation is given in the book as ages 7 to 10 but much younger children will enjoy and learn from this book, too. In fact, it will make an excellent addition to school libraries, including preschool libraries! The text for this book was first published in Hanukkah, a Crowell Holiday Book edited by Susan Bartlett Weber, in 1966. By Eve Bunting Every year a family celebrates Hanukkah by retelling the story of how Grandma and her sister managed to mark the day while in a German concentration camp. By Kate Davis Little ones learn and play with Hanukkah's Here!, a mini Soft Shapes book by Kate Davis, illus. by Bob Filipowich. Each squishy spread of this 4" 4" book features a question on the left ("What has candles/ burning bright?") and a pop-out play piece (a yellow menorah) on the right. Our best-selling series of floatable, huggable, colorful foam books for children come in a chunky size for little hands! These mini books still have pop-out shapes on every spread and still are great for bathtime, playtime, anytime. Perfect for gift baskets, Mini Soft Shapes are a surefire hit year-round! By Harriet K. Feder "No," said Judah Maccabee, when the Syrian king wanted him to change his name. "No," he said again, when ordered to pray to strange gods. Judah's defiance helped the Maccabees to victory. Only after the miracle of Hanukkah, did Judah finally say, "yes." By Batya Kirshenbaum Osterbach Pini the Pitcher is so excited about all the wonderful pure oil he has inside him. He can't wait for the Kohen Gadol to come and use his oil for the beautiful Menorah in the Temple. One day, the Greeks attack the Temple, destroying everything. Little Pini rolls away, hiding from the Greeks. When the Maccabees win back the Temple, everyone is so happy. But they need pure oil, the kind Pini the Pitcher has inside him. Here comes Pini! Rolling out of hiding so that the Menorah can be used, and the Temple rededicated. 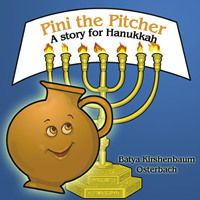 This unique spin on the story of Hanukkah focuses on Pini, the pitcher that will ultimately hold the last bit of pure oil to light the menorah. He hides from the rampaging Greeks and rolls out for the Kohen to find him. The traditional story of the Maccabees take a back seat to the focus on the world inside the Beit HaMikdash (The Holy Temple). A good book to show a rarely shown side of the Hanukkah story. By Aliana Brodmann With the Hanukkah money from her father, the little girl felt she "could buy the whole world" if she wanted. After school the next day she went from store to store in the village looking for the perfect item. She looked at hats, dolls, gingerbread men with clay pipes, and even a little kitten. As dusk approached and the stores were closing, she still hadn't made a decision. Then she heard the beautiful music. When she tossed her money into the musician's hat, he returned the gift by teaching her how to play the accordion. A lovely, quiet, reminiscence piece set in post World War II Germany. The illustrations, done in oil, bring the village and stores to life. The little girl has a thoughtful, dream-like expression-just what you'd expect from someone trying to select the perfect gift. By Nina Jaffe In a charming story from the oral tradition, a rich man begrudges three hungry children the good smells emanating from his kitchen window, and insists that they should pay for them. The kindly town rabbi comes up with a solution that is completely fair but that also teaches the miserly merchant a valuable lesson. The strong black lines of the woodcuts, combined with the colors of oil paint, give the illustrations the quality of stained glass. By Eric A. Kimmel Although Bubba Brayna is almost blind and deaf, she makes the best potato latkes in the village. On the first night of Chanukkah, she cooks a special batch for the rabbi, who is coming to visit her. When she hears a thumping at the door, she lets in her guest. Only later does she realize she has served a bear her delicious latkes. By Frank Daniel A square becomes a box of Chanukah gelt and a dreidel in this delightful, die-cut board book with simple text and full-color illustrations by the author. By Jill Foran Discusses how the celebration of Hanukkah came about, what it signifies, and the ways in which it is celebrated today. Includes lyrics in English and Hebrew, and lovely full-color illustrations throughout.